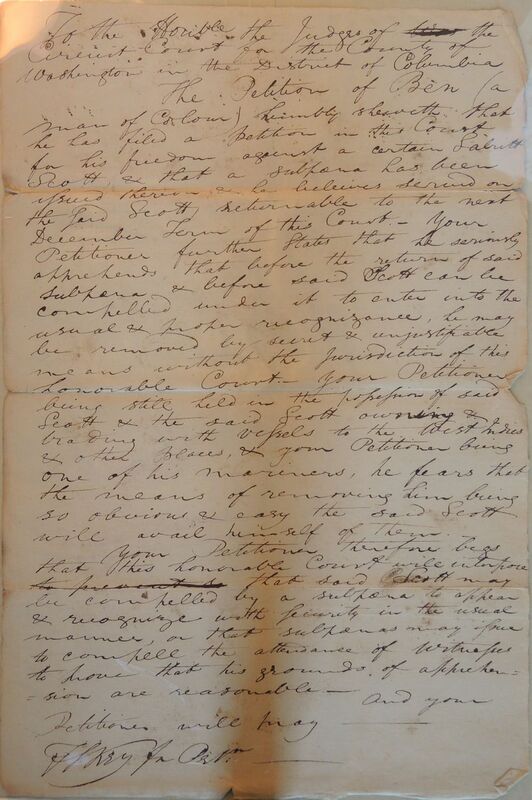 The Petition of Ben (a man of colour) humbly sheweth that he has filed a Petition in the Court for his freedom against a certain Sabritt Scott, & that a subpoena has been issued thereon & he believes served on the said Scott, returnable to the next December Term of this Court. Your Petitioner further states that he seriously apprehends that before the return of said subpoena & before said Scott can be compelled under it to enter into the usual & proper recognizance, he may be removed by secret & unjustifiable means without the Jurisdiction of this honorable Court. 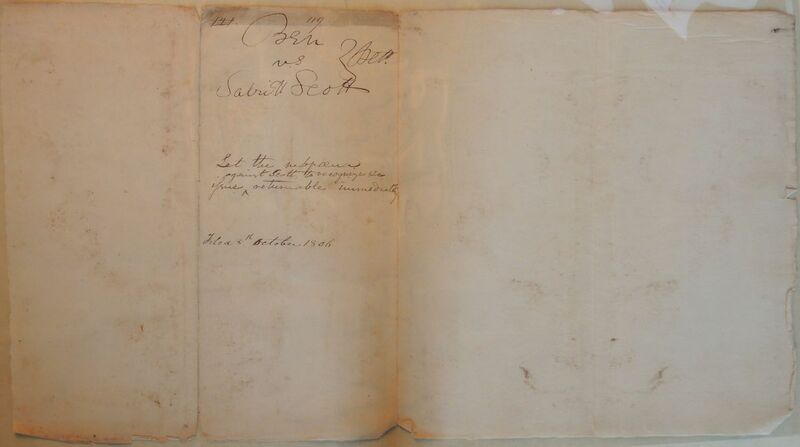 Your Petitioner being still held in the possession of said Scott & the said Scott owning & trading with vessels to the West Indies & other places, & your Petitioner being one of his Mariners, he fears that the means of removing him being so obvious & easy the said Scott will avail himself of them. Your Petitioner therefore begs that this honorable Court will interfere the prevent that said Scott may be compelled by a subpoena to appear & recognize with security in the usual manner, or that subpoenas may issue to compell the attendance of witnesses to prove that his grounds of apprehension are reasonable. F S Key for Petr.